Do you suffer from dead SKU's?? 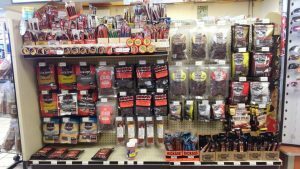 - CNC Connection Inc.
Can your Meat Snack section improve? These days Meat Snacks are all the rage. We at CNC certainly sell a lot of Old Trapper Beef Jerky. These next few weeks I want to discuss strategies to help you improve your Meat Snack Sales and Profits! While you are reading this, I would like you to picture your Meat Snack Section. The Biggest Problem I see with most Retailers is that they are over SKU’d in Jerky that just doesn’t move. All the time I’ll ask, “Do you sell much of Brand D?” Most of the time the response is “No but its tied in with my Candy rebate” or “it’s part of my contract to have this flavor”. Sometimes these Rebate Contracts read like prescription drug side effects. Often people don’t realize that the fine print of these programs will void the entire rebate if something is returned. Even if the product itself has nothing to do with Candy or Pop. So, what is there to do? You want your Rebate money, right? Well if you had a better preforming set, often the profit margin you gain, outweighs the percentage you will get back. Its almost like driving to the next town to save an extra $0.05 on Gas. Yes, your saving at the pump, but how many miles did you drive to get there? Same with your rebates. You might lose that 3% on 40 SKU’s. However, you change 3 SKU’s to a product that sells just 4 bags a week of something that makes you 40% you’ll be far better off. So, I challenge you to look at your sets and review your sales data. What isn’t preforming? Do I need this in my store? Am I better off replacing this? If you need to make a change talk with your Sale Rep. That’s what we are here for! Believe me, its in our best interests to have your Meat Snack Set preforming like an Indy Car!